Scotland's Charity Air Ambulance was awarded £8,746 to purchase new equipment for the air ambulance to help save lives of those suffering an out-of-hospital cardiac arrest. Scottish and Southern Electricity Networks (SSEN) Resilient Communities Fund announced funding of more than £187,000 to 36 groups for projects to create safer rural and coastal communities, . Community groups and charities from Aberdeenshire, Argyll and Bute, Highlands and Islands, Tayside, Stirling, Orkney and the Western Isles have all received awards from the fund. Among the awards were three major projects which will benefit the regions in the north. Neighbourhood Watch Scotland has been awarded £12,000 to bring the benefits and values of the neighbourhood watch network to Scotland’s more remote communities through Rural Watch Scotland. Scottish Flood Forum receives £10,500 to fund its Community Flood Alerting Engagement Project. This involves purchasing flood alerting systems, combined with Scottish Flood Forum on-site support to build resilience in three rural communities. 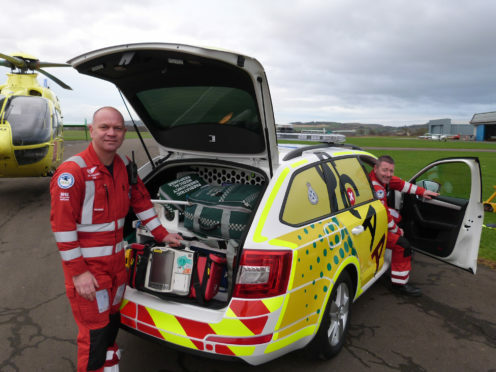 Scotland’s Charity Air Ambulance is receiving £8,746 to purchase new equipment for their rapid response service to help save lives of those suffering an out-of-hospital cardiac arrest. Lisa Doogan, director of customer relationship management for SSEN, said: “At SSEN, we work all year round to ensure we’re prepared for the high winds, snow, flooding and lightning that our weather can bring and one of our key aims is to help our customers and communities prepare for these possibilities and strengthen their own resilience too. Brian Connel,manager at Neighbourhood Watch Scotland, added: “We greatly appreciate the funding provided by SSEN through the Resilient Communities Fund. “This £12,000 award will match fund the further expansion of our Neighbourhood and Rural Watch Networks. These networks provide a mechanism to establish a community led and collective approach to a wide range of issues and to assist us and other service providers to ‘get the right information to the right people at the right time’. Katie Wylie, trusts and legacies officer at Scotland’s Charity Air Ambulance, said: “Scotland’s Charity Air Ambulance is delighted to receive funding from SSEN to support the costs towards life-saving CPR equipment. “This equipment will be used in our Rapid Response Vehicle which responds to time-critical emergencies in the rural communities around our base in Scone. Alongside the major funding, smaller amounts were provided to help smaller projects.